Take a look at the impressive Etazin Lounge Chair – a contemporary alternative lounge chair that embodies function, aesthetics and high-quality into an eye-catching chair design. 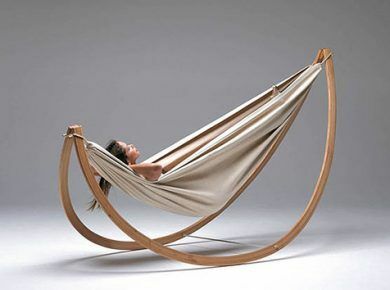 Designer Kate Brown saw this swivel/hammock chair as an artistic expression of comfort and flexibility and shares her vision in a rotating steel shape. A curved and padded lounge area was fixed on the chair’s innermost ring, inviting to comfortable contemplation and relaxation. About 8 1/2′ tall and wide, rotating its inner ring 360 degrees, this steel masterpiece engages with the landscape in a very personal and welcoming manner. An interactive piece of furniture perfect for the outdoors, the Etazin Chair is on permanent installation at Taliesin West, the main campus of the Frank Lloyd Wright School of Architecture in Arizona if any of you want to take a closer look at its elegant, imposing curves. After that, you can decide if you want to buy your own Etazin outdoor lounge chair.